I haven't been sleeping right for the last 2 nights ... yet I'm somehow not completely exhausted. I think my body is practicing for jet-lag in October - haha! And I had the weirdest dreams, which is very unusual for me. Me, I watched Desperate Housewives (which is getting pretty dull - I hope this is the last season they plan on making, seriously, where can they go from here?) 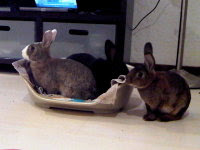 and let the bunnies run riot inside the house - cute things! Other than that I've now definitely decided that I'm going all-out to get my Polar Bear's in Canada trip sorted out. I figured if I can save like a demon between now and then, it won't dent my savings too badly. And I'm now starting to get super excited about our Beach Break in Zanzibar in September. After finding little that a) fitted my budget or b) appealed to me at the usual Travel Agents, I contacted Barefoot Breaks because they have some amazing Zanzibar options on their site! And have so far been very impressed with their service :) I had a long phone call with them on Friday morning (probably less than an hour after I sent an email outlining what I was looking for) and yesterday evening I received an email with holiday 5 options within our budget. I'm really starting to get excited about these trips now. Now to investigate the visa's for Canada!! Oh your boons are too cute! Glad you've decided to go for the trip - now you can start looking forward to it. Love the bunny pictures... they are so cute!